Sometimes coffee isn’t enough to jump start a day. That’s where the Bloody Mary comes in. 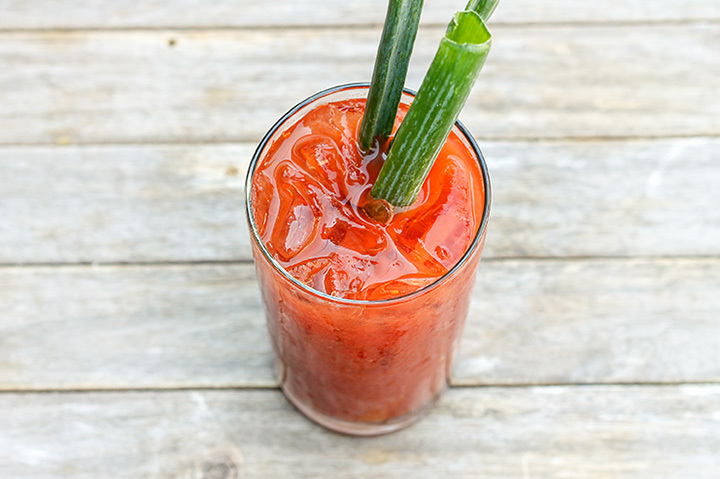 A fixture of brunch, the most dynamic of cocktails, Bloody Marys are defined by robust tomato flavor and a party of veggies as a garnish. Oh, and vodka. Check out these 10 awesome places for a Bloody Mary in Colorado! Fresh. That’s the catch of the day at this seafood house and oyster bar. Seafood is flown in daily and that includes the whole crab claw you can add to the Best Bloody Mary on the menu. The house-made mix is a combination of V8, Cholula, and samba. Added to that are thin pickle slices, Castelvetrano olives, horseradish, and Worcestershire sauce. It’s spicy, but oh so good. Crab claw costs a little bit more. Giddy-Up! That’s a directive to go to this bar as well as the name of the signature Bloody Mary served here. It’s got a kick, too. The house-made mix is doused with Finlandia vodka, spiced up with habanero, cilantro, and chipotle spices then garnished with a swizzle meat stick, pickled brussels sprouts, pickled green bean, pepperoncini, celery, and olive. A perfect apres ski refreshment. You won’t catch a wave at this landlocked restaurant, but you might hang 10 a little sitting on the patio. Enjoy the cool vibe at this neighborhood surf and turf spot with a chilled Bloody Mary. The favorite here is made with Breckenridge Distillery’s Chili Chile Vodka, served with green olives, a pickle, slice of squash, stick of celery and one hot pepper. The salt rimmed glass is a definite lip smacker. Named the “Best Bloody Mary in Summit County” by the Summit Daily is a statement that the drink here is more than just tomato juice. In fact, the base is the owner’s secret, homemade mix, the ingredients of which are never revealed—to anyone. No matter, the only thing you really need to know about this cocktail is that it’s delicious. Creativity is rewarded here at the Sunday Brunch Bloody Mary Bar. You start with a glass of ice and then pick and choose from a variety of ingredients and additives to make the drink of your dreams. The highlight is the Bloody Revolution Ribeye mix, but the garnishes of pickles, habaneros, pepperoncini and a range of spicy hot sauces send the drink over-the-top good. This small-batch craft distillery has the distinction of being the oldest locally-owned one in the state. Take a tour or hang-out for a tasting, but don’t leave without trying the signature Goat Pepper Bloody Mary, billed as the best the world has ever known. With a full salad of garnishes, including pickled okra, it’s more than a drink, it’s an experience. Customized Bloody Marys … a trend worthy of exploration here at Bloody Mary’s Back Bar. Begin with the fresh-juiced mix, a blend of eight vegetables. And then the fun begins. Add a blue cheese stuffed olive or a pickle spear, a slice of honey cured bacon of some pepperoncini. Spice it up with pickle juice, fresh horseradish, Sriracha or Porter beer. If that’s not enough add some white rum, beef broth gin or wasabi. Rim it with kosher salt, Old Bay or Mother’s own Spicy Salt Mix. Sunday Brunch is prime time for Bloody Marys here. You’ll get the tasty trademark drink at a reduced price! If you can’t make brunch, the weekday specialty is the Corpse Retriever, made with house-made mix and brine infused vodka, and, of course, embellished with an array of tasty treats. Everything is always better with bacon! That holds true with the Bacon Bloody Mary served here, too, a zesty way to end a day of activities on the mountain. If pork is not your thing, though, then snag a regular Bloody Mary with the same first-class ingredients. Both are served with a fresh bunch of veggies. An award-winning Bloody Mary for a price that can’t be beat at a make-your-own drink bar puts this restaurant at the top of the list of places to go for this tomato-y cocktail. The mix can be spicy or mild and comes with a shot of vodka. Full access to zesty ingredients and bowls of pickles, lemons, limes, olives and cocktail onions provides an opportunity to step outside the traditional Bloody Mary box.